If you have seen my article on the best cheap mountain bike helmets, then you likely noticed that I did not include any that are specifically for women. There is a reason for that, and it is does not have anything to do with quality. In fact, there are lots of great women’s bike helmets out there for purchase. It just so happens that I am not a big fan of most women’s helmets because the manufacturers insist upon forcing traditional “girly” colors on you. Just because I am a female does not mean that I love the color pink; I rather hate it actually. For me, I prefer darker and bolder colors, so that is why I do not get a lot of gear that is designed specifically for women. That being said, I have come across a good women’s mtb helmet that is high quality and is available in bold, bright colors as opposed to pastels. So, if you are also on the search for a darker color mtb helmet for women, then let me share my top pick with you. Though it is not the cheapest option out there, this Fox Racing women’s mtb helmet delivers a lot of value for the money. 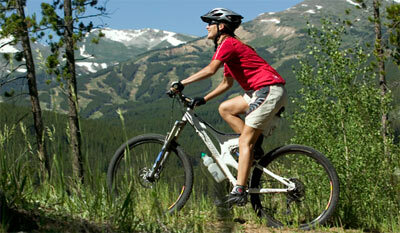 In fact, I’d probably say that it is the best women’s mountain bike helmet in the under $100 – $200 range right now. That is why it is my top pick in this category. You can order up this helmet in either a matte black or an orange with white color choice. So, you do not have too many color options there, but at least none of them are pink! If you ride in humid or really hot conditions, then you will love the air flow this baby offers thanks to its 20 ventilation points on the helmet. The vents are fairly large in size, so you get some nice air flow moving through there. If you are not a fan of visors on your helmets, then take note that this one is removable. That feature is not really a big deal to me, but I know some women are not fans of the visors. I find that you get a lot of protection out of this mtb helmet, thanks in part to its deep rear EPS profile that offers up additional coverage. I can also get a pretty snug fit with the straps due to the Detox retention system. No matter how tight or how loose I want those straps, I can easily make the necessary adjustments, which is important to me cause I don’t want to waste time on the side of a mountain fiddling with straps. 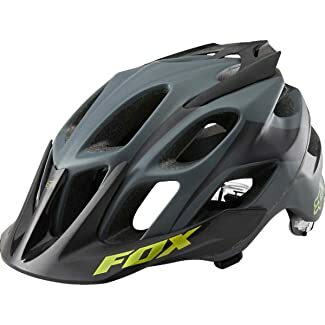 This helmet is well rated with all the relevant safety standards boards, plus it is made by Fox Racing so you know that you are getting some quality gear when you buy it. I had a hard time finding this is any local shops, so you might have to order it online before you know how it fits. If so, stick with a site like Amazon where you can return it for free if the fit is not good for you.